Many hams that get the electronics or CW bug try a Code Practice Oscillator (CPO) kit sooner or later, or maybe orders a pre-made set, like one offered by MFJ. After a while, anyone that uses a certain type of CPO will eventually tire of hearing the harsh tone that comes from it. There’s a good chance the annoying sound quality is caused by the CPO’s circuit itself. Many such circuits make use of the venerable and ever-versatile “555” timer IC. 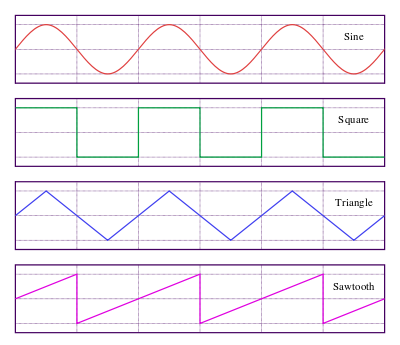 It’s not the IC’s fault but the waveform produced by the circuit that uses it. Generally what you get is a ‘squarewave’- based tone that, by its nature, sounds raspy, and when keyed on and off abruptly creates sound artifacts such as clicks and pops. On top of that, many oscillator circuits used for CPOs have their main power turned on and off as part of the keying process which often causes ‘chirps’ and slight fluctuations in pitch because it takes a split-second to settle the levels, so to speak. With an abrupt starting and stopping of the signal you also end up with ‘clicks’ and ‘pops’ and other artifacts. The sound produced by a circuit with these issues can grate on the hearer’s ears and actually cause fatigue in longer practice sessions. Real radios use sine-waves! Since there are practical reasons why your transceiver uses sine-waves in its operation – why shouldn’t your Code Practice Oscillator? Try this one! as an educational tool for Foundation students. Steve's site includes a comprehensive PDF schematic of V 2.0 as well as resource files for professional PCB reproduction. A Sine-wave is the purest expression of energy on any single given frequency. A Square-wave is not a pure signal and is composed of odd-integer harmonic frequencies and thus has a harsher sound quality. A tone composed of a signwave has a pleasant and smooth sound to human hearing. Click on pic for printable version. 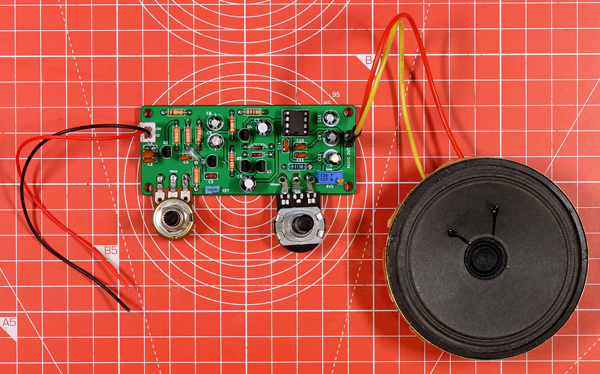 You can build these circuits on a “breadboard” if you wish. Also known as a “solderless prototype board”, they’re available at Radio Shack for as little as $10 with jumper wires for $7 and consist of strips of metal contacts encased in plastic that allow you to plug in wires and components to build circuits. Without solder they’re ‘recyclable’, which means you can build as many circuits as you wish. 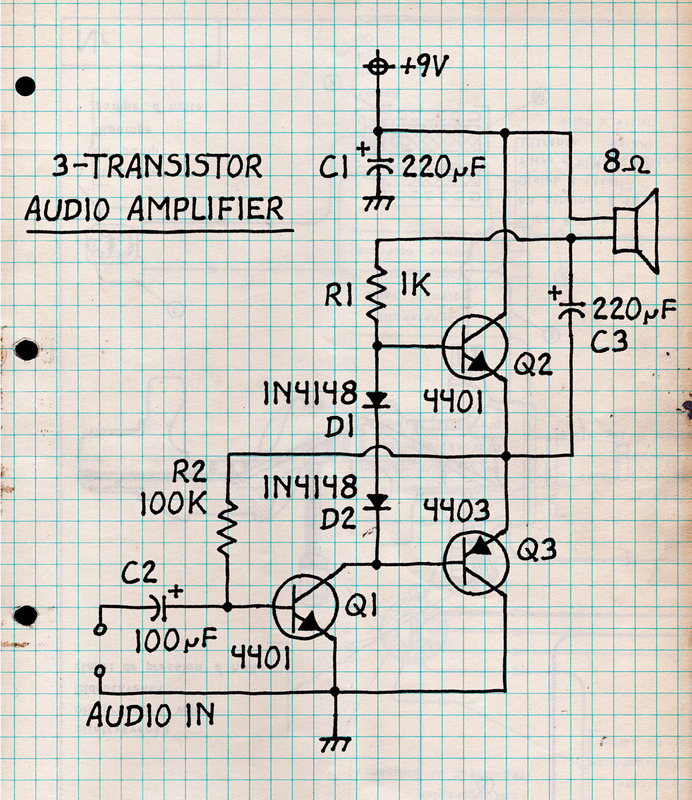 This 3-Transistor audio amplifier can provide a modest amount of volume for any audio project and doesn’t require many parts. It was a common design used in some later transistor radio designs and will provide 100mW of audio power to a 25 ohm speaker. A Small PM speaker should be used. An 8 or 16 ohm speaker can be used just as well with down to around 50mW of output. This is a forgiving circuit and many parts values can be substituted including the transistors such as using the common 3900-types. Q2 is used as the pre-amp, and Q1 and Q3 are the speaker drivers. Diodes D1 and D2 are used to create constant bias voltage. R2 can be adjusted from 50k-500k to peak the transistor’s bias but consider using heat sinks if the transistors get too warm. Try it once constructed by applying a very low-volume signal to the input from any audio source such as an mp3 player. You should get about a 5-times gain factor. 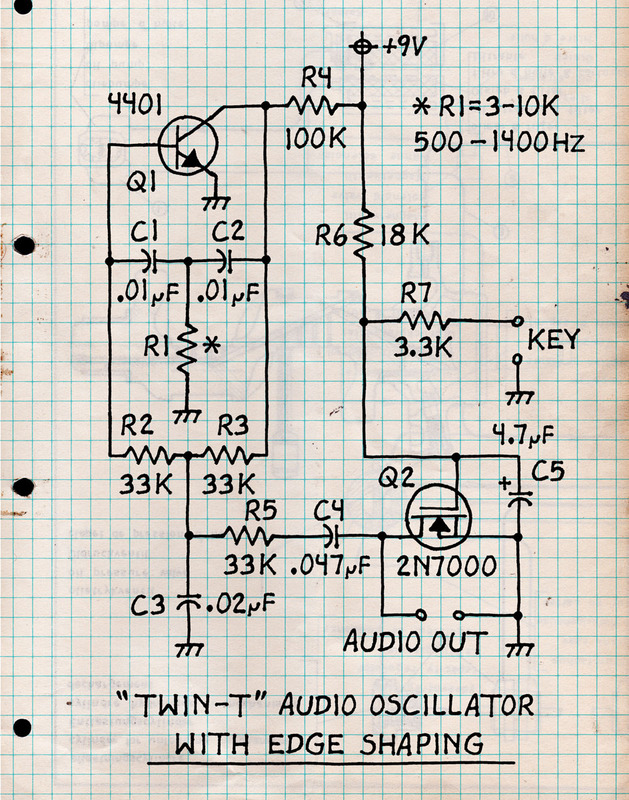 The “Twin-T” oscillator is a classic design. It produces a sign-wave audio signal with very little distortion by using a complementary pair of high-pass and low-pass RC filters - shown in the schematic by the two obvious ‘T’ configurations. C1 and C2 must be the same value, and C3 must be exactly double the value used for C1 and C2. Just use two 0.01μF caps tied together in parallel. Adjusting R1 will change the resonance frequency of the oscillator: A 10k potentiometer can be used and a value of 3-10k will get you a range of around 500Hz–1400Hz. You can try any type of NPN transistor and there should be enough output to drive a small high-impedance earphone. The second part of the schematic shows a common 2N7000 MOSFET and other various discrete components. 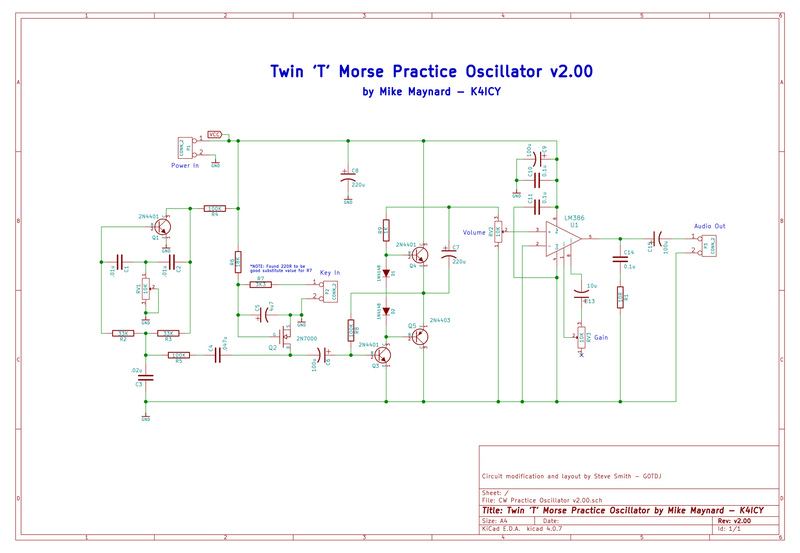 Used in this configuration, the MOSFET will smoothly ‘ramp’ the signal level of the oscillator in and out. When the ‘Key’ circuit is brought to ground potential through R7, C5 is bled at a fixed rate and Q2 loses gate saturation. The ‘Twin-T’ audio signal is now left untouched. When the ‘Key’ is released, the voltage potential to Q2’s gate is brought to positive through R6 while re-charging C5 thus the audio signal is now gradually shunted to ground. R6 and R7’s values are chosen for around a 10ms transition time. You can adjust these to change the attack and decay of the CW envelope. 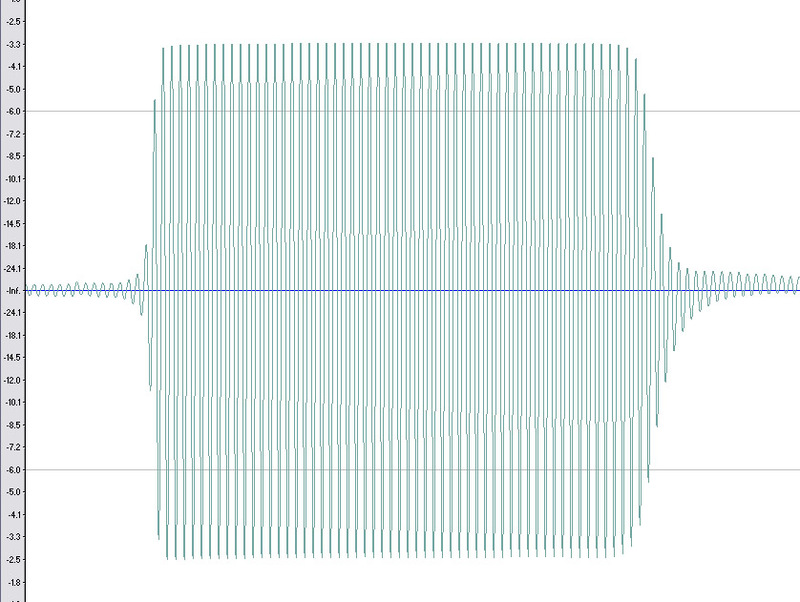 The image above is an actual wave-scope display of a 15wpm ‘dit’. 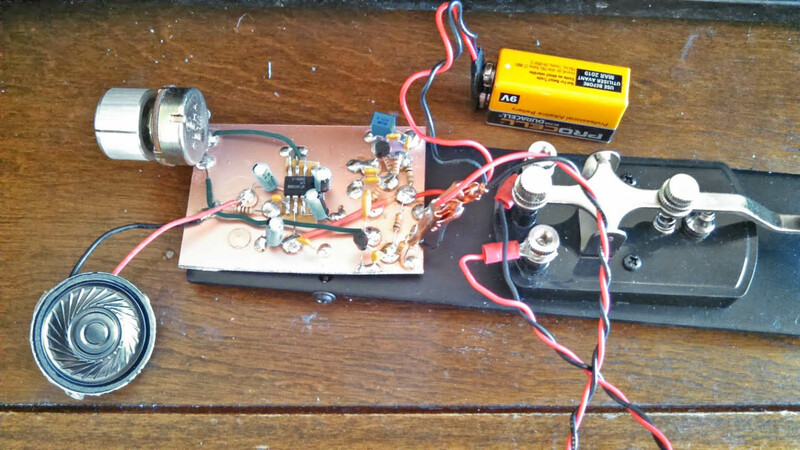 The result produces an easy to listen to CW sound and I was able to build everything on a Radio Shack prototyping breadboard in about half an hour. Using a breadboard is the next step up from the spring-terminal project labs that were once offered by Radio Shack, and they allow you to do so much more. This circuit can be transferred to a throughhole and soldered Vero prototyping board and then into a project box. Once finished you can enjoy hours of smooth and pleasant-to-the-ears CW practice! Here is a quick and dirty layout on a solderless breadboard. 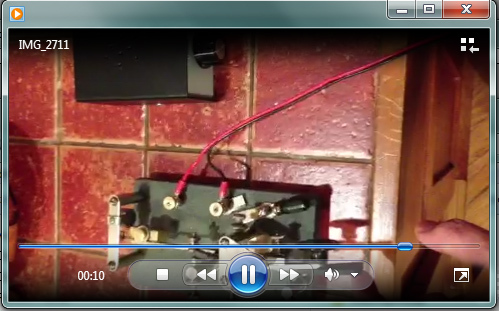 Chris incorporated an LM386 audio amplifier and is shown here using the CPO to get great practice with his newly acquired Vibroplex bug. Chris also suggested changing the value of R5 in the oscillator circuit from a 33k ohm resistor to 100k when using an OP-amp or such type as the LM386 to reduce audio bleed-through due to too much gain. Walter also uses an LM386 audio amplifier, and just look at that "Manhattan" style construction - This is definitely a major upgrade for his old MFJ Code Practice Key! 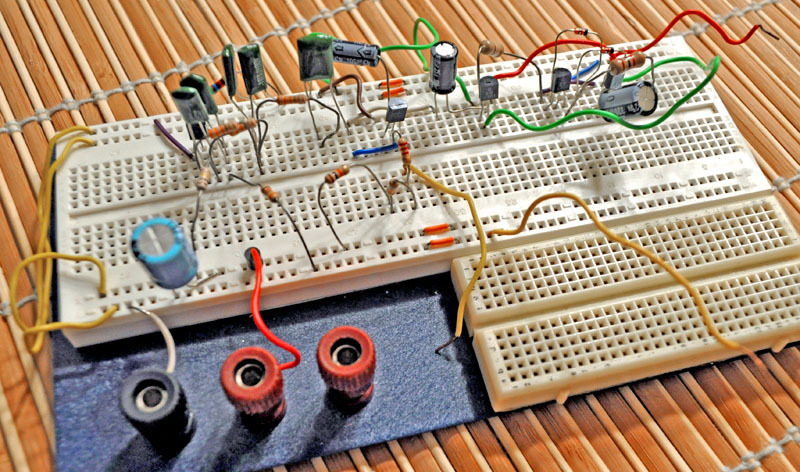 Have some fun this weekend… For goodness sakes - get out your breadboard and build something!